KIAPS are nothing new to Korean or Japanese martial arts. It basically meaning "yell or shout" when practicing Hapkido and Taekwondo. Hapkido comes from 3 words: "Hap" means to combine, coordinate, or make one; "Ki" identifies the power that pervades the universe, and has been defined as mind, spirit, heart, or breath and "Do" means the way or the path. It is described as "the way of harmony" According to Master Bong Soo Han, Hapkido is a Way of Life, with the goal being “Perfection of Character,” attained through the coordination of Mind, Body and Spirit, by practicing meditation, “breath control,” (Ki exercises) and the rigorous physical martial art techniques of Hapkido. 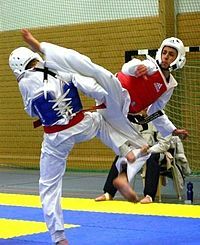 Taekwondo, on the other hand, is composed of three parts as shown in the English spelling, though it is one word in Korean. "Tae" means "foot", "leg" or "to step on"; "Kwon" means "fist" or "fight"; and "Do" means the "way" or "discipline." Tae Kwon refers to put things under control. Thus, it is "the right way of using all parts of the body to stop fights and help to build a better and more peaceful world." So, Why considered training Hapkido? Lose Weight - a healthy way to lose weight and keep it off. Reduce Stress - Exercise is proven to help reduce stress. Confidence - As you grow your skill set, your confidence in your every day life will grow stronger. Learn Self-defense - We focus not only on techniques, but also awareness and show how to avoid situations in the first place. Respect - For yourself and for others. It is one of the concepts that is key in Hapkido.. Mental - By physically training, many students find that it help clear the mind and makes them more alert and sharp. Spiritual - We train the mind, body and spirit. Community - Everyone is working towards common goals and helps each other achieve their goals. Ki Breathing - Creates a sense of well being, improved focus, stress reduction, improved circulation, cleansing of the body, increased ki energy, improved oxygenization of blood for increased alertness. Take a look at this Tutorial!! !